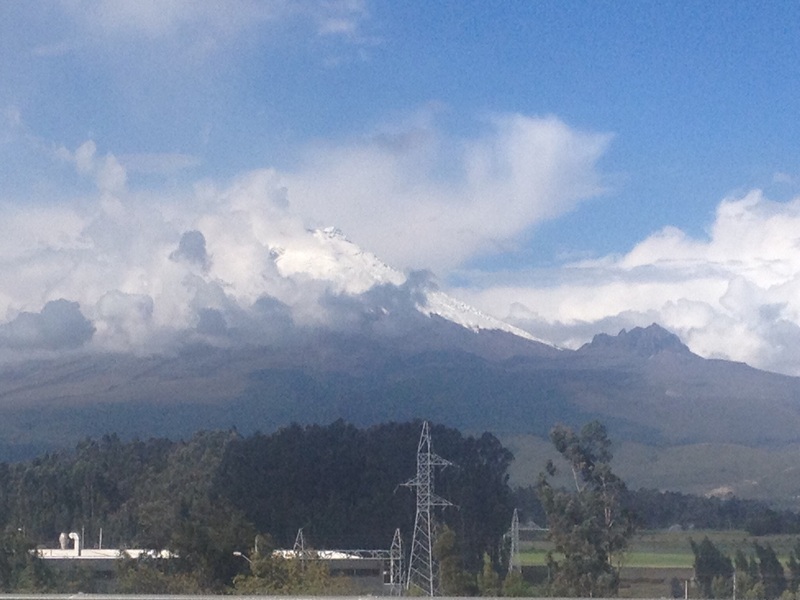 On the first sight of a snow capped mountain, on the way to Quito, I stopped for a picture and my optical nerves also stimulated that part of my brain cells which contain memories of past mountaineering. My days in Quito were going to be busy planning an expedition. First thing first. 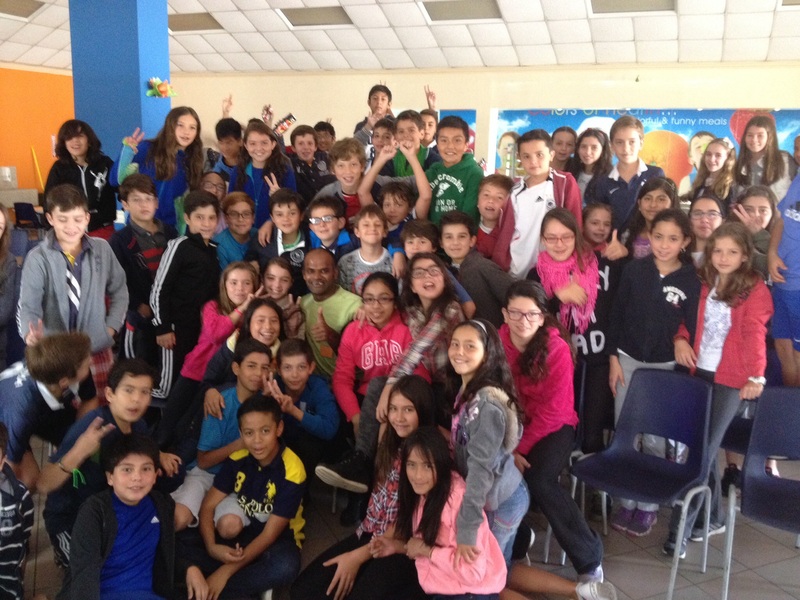 In Quito, Keith, whom I knew through a Facebook group, a maths and science teacher at Colegio Menor helped me to organise a talk at his school. Tim, the lower school principal and I planned three sessions over few email exchanges. The level of planning and organising was a good sign of what was to come. After the session, I felt the 5th graders were very aspirational, respectful and avid learners. 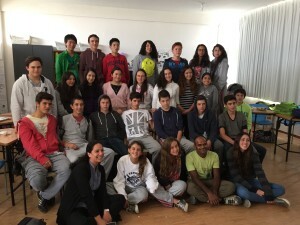 Those intrigued young minds bombarded me with questions from left and right and before I knew my time was up with them – I missed being in a classroom. This was an amazing bunch, so young, but high in spirits. I also had an opportunity to observe a 4th graders lesson where they were doing mock presentations for a forthcoming event. The constructive criticisms by the rest of the class for each group made me want to stay with them for longer but every lesson was only 45 minutes long! I was also given a tour of the school when I saw the exceptional art work and music work by their students, professional and outstanding indeed. Overall, I felt Colegio Menor is one of those schools where every teacher would wish to submit their CV. At 4800m, dogs don’t feel the altitude? 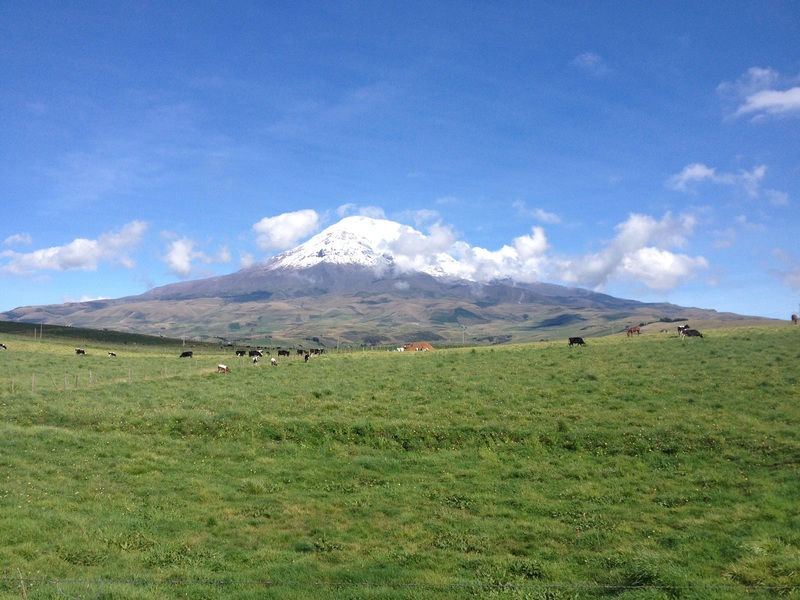 Cotopaxi 5897metres: The tour agencies in Quito sell a two day package to climb this mountain for 240 USD a nice marketing strategy to attract every adrenalin junky. First day is a drive up to 4500 metres and a 45 minutes walk up to the refugio at 4800metres and the very evening around 10pm leave for the summit. From my past experience, I was not comfortable with this plan. For a mountain of this size I felt two days was too quick. I found another agency whom offered a 4 day trip. I signed up for this just over a telephone call since the group was leaving the next morning. This agency took their clients on the south face of the mountain. The first day we walked from 3200metres to the refugio at 4000metres. It was a nice 3 hours walk when a dog from the village followed us all the way up. 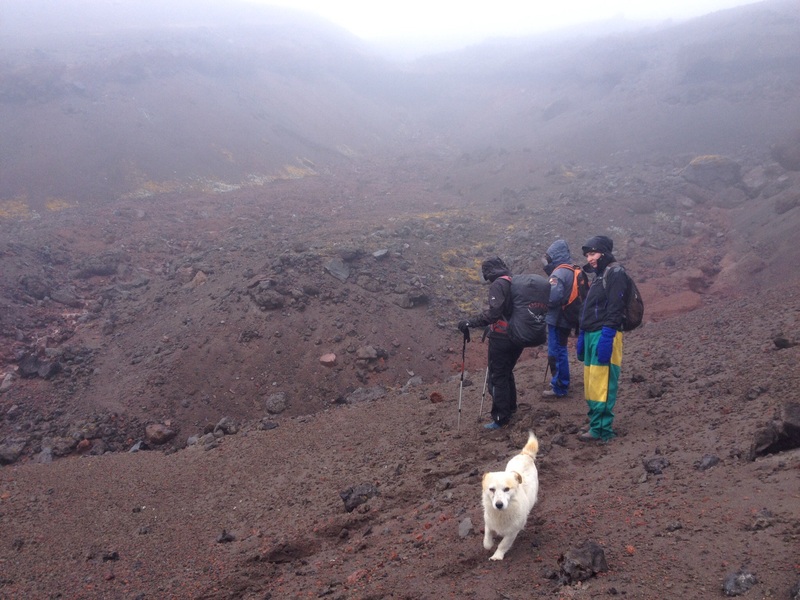 The next day was acclimatisation walk to 4800 metres and back to the refugio. The dog was happily running around with us the whole time once again. The weather was not great though, cloudy and rain for most part. The third day we left at 2pm and reached the high camp at 4800 metres which was just a few metres away from the glacier around 5pm. It was one of those awful walks, rain the whole time and with no views, just plodding along to the destination. I had to hire the gear including a backpack. On arrival at the high camp which was nothing but a shelter, that too a leaky one, my clothes and my boots were totally soaked. With no spare clothes or shoes the chances of leaving for the summit looked low. Sometimes desperation takes over the logical side of human brain. I was hoping for my shoes and clothes to dry out over the next few hours. How silly. When the time arrived, 10pm, everything was still wet, I had to call off my summit attempt with great pain. The rain had not stopped either and we had to spend the night there. In a sleeping bag designed for beach weather my cold feet kept me awake the whole night. The morning came eventually, the wet socks from previous day was crispy from the water that froze and I had ice on the gloves. Besides the gear weather was another factor. The tail end of the rainy season perhaps was not the best to climb a mountain. 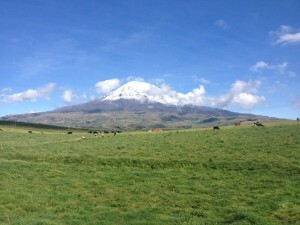 We never saw the top of Cotopaxi the whole four days. 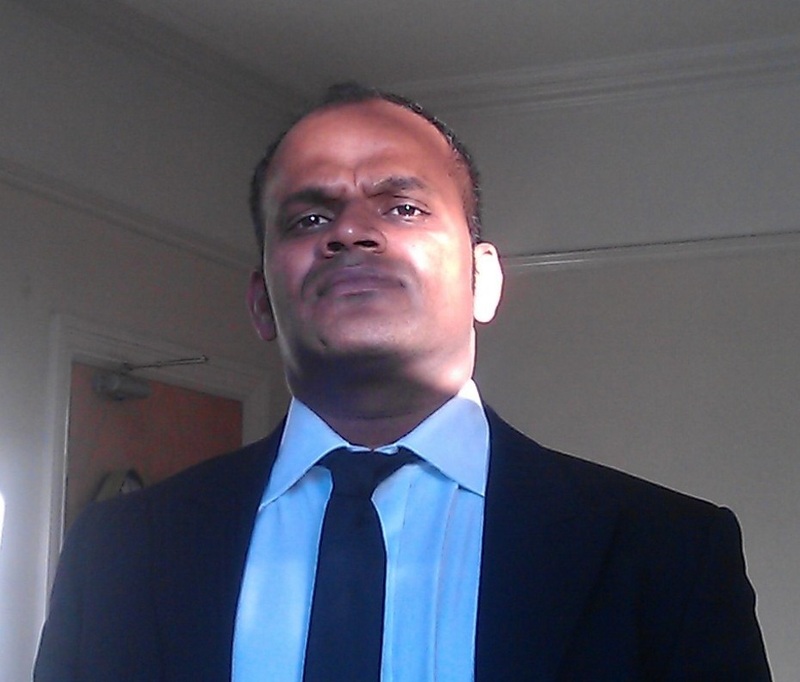 I felt a great disappointment for not being able to summit but some valuable lessons were learnt. 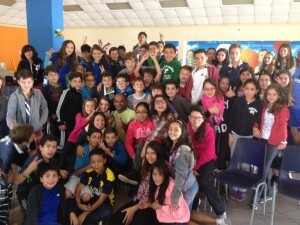 The American School at Quito invited me for a talk which I happily obliged even though I had left Quito. 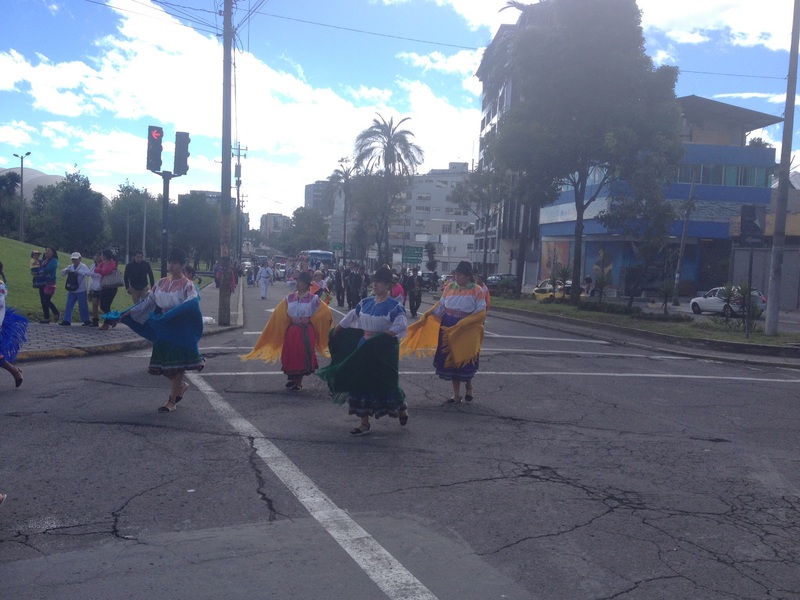 It was a three hour bus ride to Quito from Riobamba and it was worth it. I spoke to grade 10 and grade 9 pupils there. From what I have heard during my talks previously at several schools the aim/dream of young people vary from wanting to become a doctor, engineer, architect, scientist, footballer, to travel the world, or even win a Nobel price. But one of the grade 9 pupil in this school said something that got me very excited. His dream was to play football in the Moon. I felt ideas such as these are important if humanity is to continue its progress. I hope his dream becomes reality in my lifetime! 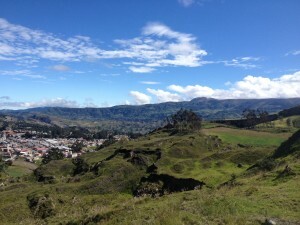 Between Quito and Cuenca I reached 3500 metres altitude three times, although the altitude never dropped below 2000metres. This entire section was just up and down, up and down the whole time and with this comes the rewarding views of deep valleys, cliffs and sheer drops. The road from Quito to Riobamba was a busy 3 lane highway for the most part. On the first day of my ride from Quito I was pleased to get a brief view of Cotopaxi in between the gaps through the clouds. 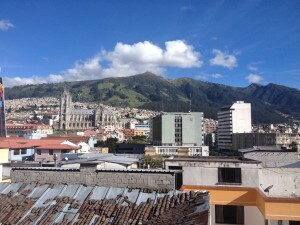 In Riobamba I stayed with another brilliant Warmshowers hosts, Borja and Nathalie. It was one of those places where I become part of the family within few minutes of my arrival. I was quite spoilt by Natalie’s parents, they even packed some snacks for my trip – my mother would be pleased to hear this. 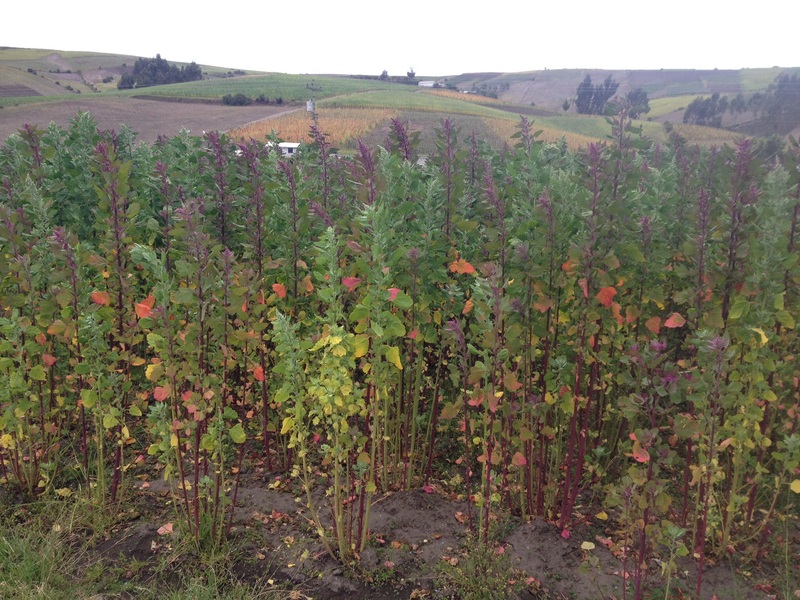 After Riobamba the road passed through lot of fields where they grew quinoa. 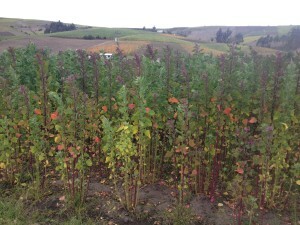 I have seen these grains but this was the first time I saw the actual plant that produces them. There were so many colours within the same plant and it made me wonder about the science behind this. There were agriculture fields on the mountains as far high up the mountains as they could be. The colourful clothing and hats of those who were working in the fields rivalled the top hats of the aristocrats of the shires of southern England. 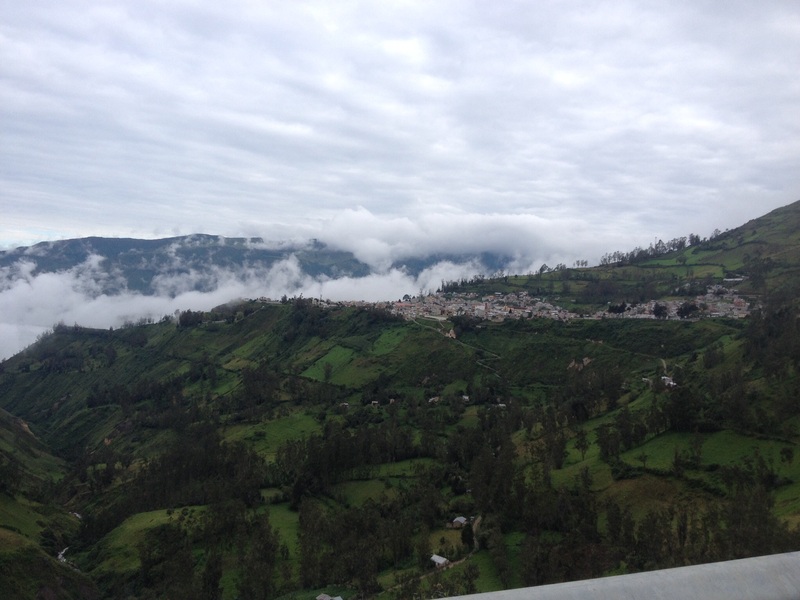 Riobamba to Cuenca was a four day ride and the pattern was same each day, clear skies in the morning and heavy fog in the afternoon. 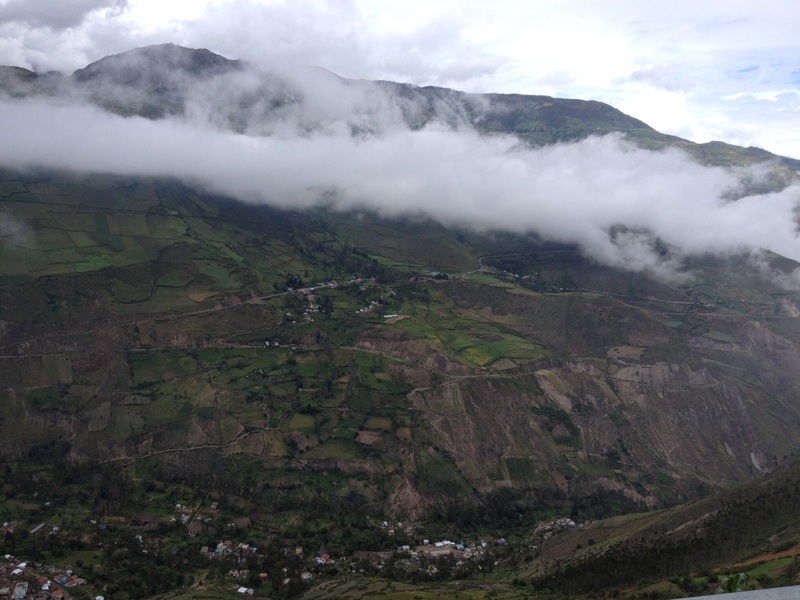 This section was another classical Andes mountain range that most cyclists would not want to miss. 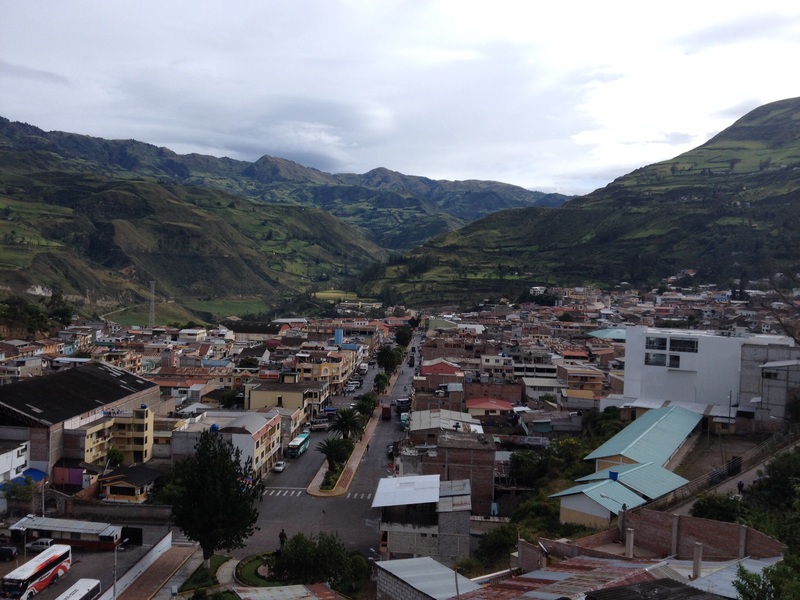 Alausi was my first stop after Riobamba. This town was surrounded by grand mountains on all sides. There was a long drop to get into this town and consequently a steep climb back up to leave this valley. After the 7 Km’s steep climb to the top of the valley, the other side was equally stunning. The road went down again and climbed back up on the other side of the another valley. However, the fog reached the other side of the valley before I got there. 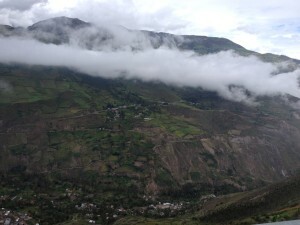 The visibility was poor (see the video) but I had to continue and I reach the town Chunchi eventually. The next morning the clear skies revealed what I missed coming into Chunchi the previous day. This town was perched on top of a cliff with a big drop on the side. The first 20 Km’s leaving Chunchi was a good climb which I managed well – having good views helps. As I was getting closer to El Tambo I was shrouded by the fog once again and this time it was quite heavy. As my body produces more heat due to the work out the fog condensed all over and my shoes got wet a good heat transfer experiment. As long as I don’t stop pedalling cold feet was not a major issue. Once again, I missed seeing the surrounding mountains near El Tambo. I just had to wait until the next morning. In El Tambo I stayed at the Bomberos (fire station) whom were very popular among touring cyclists. The sun was out in full form the next morning. The 17 Km’s climb from El Tambo to an altitude of 3550 metres felt lot better in the sun. 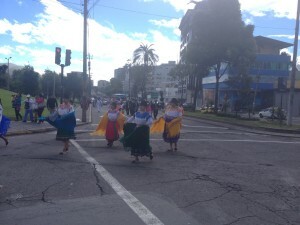 What followed was a well deserved long downhill and some riding on flat roads to Cuenca. 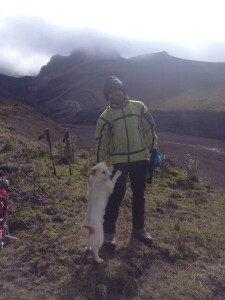 I like dogs when they don’t bark at me like the one that followed us in Cotopaxi for two days. 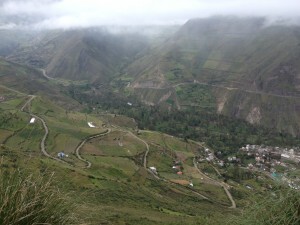 In the past, many cyclists complained about the menacing dogs between Riobamba and Cuenca. I can guarantee this is still the case. I had dogs rushing from the mountain side to get a bite off my calves. It’s certainly was not pleasant to see those canine teeth so close to my heel. I tried shouting at them. They backed off for a second and returned with vengeance. I wish they could understand the grimace on my face. I can’t hide my hatred for my barking dogs anymore. It has been a year since I left London i.e 1st June 2014 and I have pedalled approximately 14,750 Km’s so far through 11 different countries. I find it hard to describe my experiences in a few lines. To keep it short life on the road has been fantastic, exceeding my expectations by several fold. Congratulations on a year of travels !! More fantastic news from the road. My dad would have loved to be with you in those classrooms. Lucky you to share with those lucky kids. Football on the moon! Thanks John, Yes Football on the Moon, who would have thought!